21st, Saturday, 11:00 am-1:00 pm - Langston's Western Wear, Stockyards, Exchange Ave. & Agnew, Oklahoma City. Jim & Richard Sharp. PBR bull riders signing autographs. 1st, Wednesday, 10:00 am - Rambling Oaks Assisted Living, Norman, OK.
23rd, Thursday, 6:30 pm - Annual Meeting & Banquet, Garvin County Cattle Producer Association, Garvin County Fairgrounds, Pauls Valley, OK.
9th, Sunday, 4:00 pm - Branded Cowboy Church, Lucien, OK. Trail Ride starts at 1:00; cowboy music starts at 4:00. For information call Don Knott, 405-747-4812. 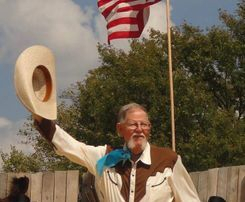 14th & 15th, Friday & Saturday - Living History Days & Chuck Wagon Festival, Chisholm Trail Museum, Kingfisher, OK.
30th, Sunday, 12:00 pm - Chili Cook Off, Lakeside United Methodist Church, 2925 NW 66th St, Oklahoma City, . 27th, Saturday, pm - Boy Scouts Campfire Singing - National Cowboy and Western Heritage Museum, Oklahoma City. Private party. 3rd, Saturday, 12:00-2:00 pm - Langston's Western Wear, Oklahoma City Stockyards Area, Agnew & Exchange Avenue. Richard Sharp & Jim. 9th & 10th, Friday & Saturday - Pawnee Bill Wild West Show, 1141 Pawnee Bill Rd., Pawnee, OK. There is a day of activities, visit at the museum, and a meal can be purchased leading up to the evening Wild West Show. Check out advance pricing. 5th, Wednesday, 10:30 am - Blanchard Public Library, Blanchard, OK. Public invited. 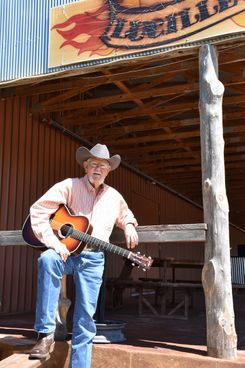 13th, Thursday, 6:00 pm - Cowboy/Western Swing Show, Lucy's RV Park, La Veta, Colorado. Open to the public. 21st, Friday, 11:00 am - Birthday Party, Baptist Village, Oklahoma City. Private party. 27th, Thursday, 5:00 pm - Indian Electric Cooperative, Cleveland, OK.
4th, Friday, 6-8:00 pm - Lucille's Restaurant, Mulhall, OK.
6th, Sunday, 7:00 pm - Church Service at the Pawnee Lakeside Event Center, Pawnee Rodeo Grounds, 2 miles north of Pawnee, Oklahoma, on Highway 18. Public welcome. 9th, Wednesday, 10:30 am - Seniors Show, First Baptist Church, McLoud, OK.
26th, Saturday, 7:30 pm - Rodeo Opry; Exchange & Agnew Streets, Oklahoma City. Jim hosting & entertaining. 8th, Friday, 6-8:00 pm - Gospel Show, Pottawatomie County Fairgrounds, Shawnee, OK. Open to the public. 7th, Saturday, 10 am -1:30 pm - Heritage Days, Atkinson Heritage Center, Midwest City, OK.
12th, Thursday, 12:00 pm - Noon Tunes, Downtown Library, Oklahoma City, OK.
13th, Friday, 12:00 pm - Lions Club, Guthrie, OK.
14th, Saturday, 6:00 pm - Rodeo, BBQ and Concert, Cowboys United Buckle Series Family Rodeo Finals, Chandler, OK. Celebrating the completion of their new church building. 4th, Saturday, 7:30 pm - Rodeo Opry; Exchange & Agnew Streets, Oklahoma City. Jim hosting & entertaining. 17th, Friday, 6-8 pm - Campfires, Cattle & Cowboys Gathering, Chisholm Trail Museum, Duncan, OK. The tentative schedule is for me & Susanne Woolley to be on stage at 8:00-8:20 pm. 2nd, Saturday, 12:00-2:00 pm - Christmas Parade, Langston's Western Wear, OKC Stockyards Exchange & Agnew Streets. 21st, Thursday, 2:00 pm - Christmas Party, Crescent Nursing Home, Crescent, OK.